To end the opening ceremony of BlizzCon 2014, Blizzard Entertainment introduced a brand new game: Overwatch. This is a brand new IP from the studio that has stuck to its Starcraft, Warcraft, and Diablo titles for years. Overwatch is a team-based, multi-player shooter, and from the first video shown of gameplay, it certainly has a Wildstar meets Team Fortress 2 vibe. Characters will have a wide variety of guns and tools at their disposal on some interesting urban and historic-style maps, and in addition to special abilities, we also got a chance to see some characters in a flight mode above the streets. Overwatch’s game director is Jeff Kaplan, and BlizzCon attendees will be able to test drive the game during the weekend. Stay tuned for more news about Overwatch as we get it! Edit: The Overwatch website is now live at http://us.battle.net/overwatch/en/ – and beta sign-up is already available! You can watch the BlizzCon livestreams here. Late Edit: The official press release for Overwatch is now available, you can read it below. 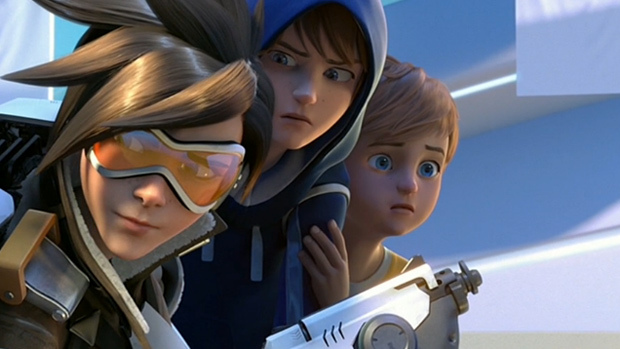 In front of a live crowd of more than 25,000 BlizzCon® attendees and an expected online audience numbering in the millions, Blizzard Entertainment today announced Overwatch™, a pick-up-and-play first-person shooter featuring an amazing cast of heroes and set in an all-new Blizzard game universe. At BlizzCon this weekend, Overwatch is fully playable and running on 600 PCs, and attendees there are the first in the world to play it. Gamers at the show are able to select from a current roster of 12 playable heroes and go 6v6 against each other, capturing or defending points and attacking or delivering payloads across three wildly different maps. New heroes and maps will continually be added to the game as development progresses, and beta testing will begin in 2015. Learn more about Overwatch, including all of the heroes and maps revealed at BlizzCon, and sign up to participate in the upcoming beta test at the official website, www.playoverwatch.com. Further details about the game will be announced there in the months ahead. ESL announced today that the Intel® Extreme Masters’ ninth season is to begin in China for the second consecutive year. MindArk, the software company behind the MMORPG, Entropia Universe, is proud to announce the launch of their token sale.